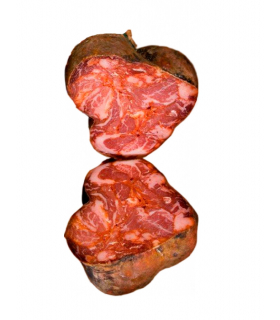 Organic Ham from Jabugo. 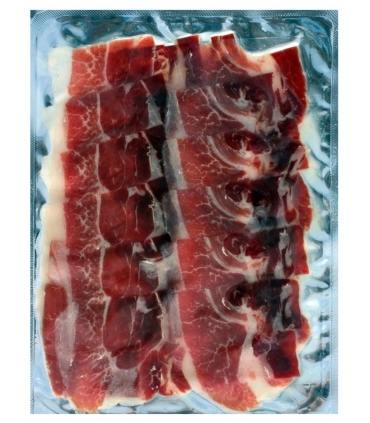 The PATA NEGRA ham slicing in Finca Montefrío farm. Sale in vacuum packaging. 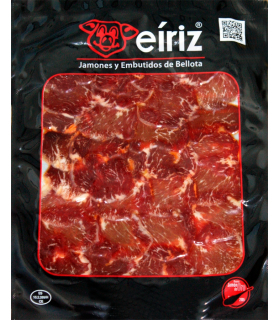 Iberian Bellota ham finely sliced. Pigs from organic farming, reared outdoors, under strict and natural diet. Raised in ideal conditions by Armando and Lola on their organic farm Montefrío, these 100% Iberian pigs allow to obtain very fine organic sausages. 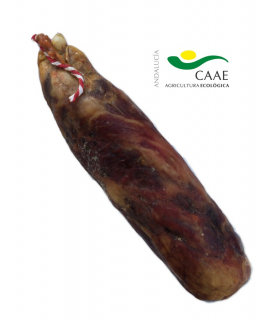 Ham, cut and sold here, is of an extraordinary quality, a perfect harmony of lean meat and fat, with intense flavors of acorn. These pig have got the Ecolabel "Pata Negra",besides they get the Origin appelation label, and lead from the black ring 2014 (100% Iberico bellota) classification of Iberian pig in Spain. Sale in vacuum packaging. Exact weight.